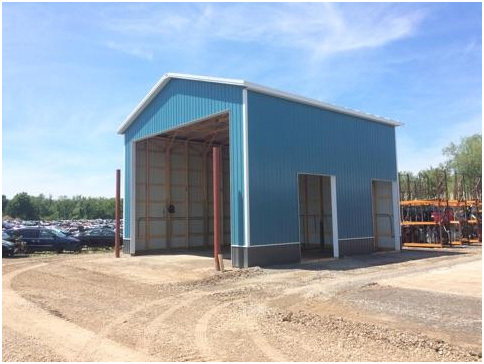 The gas punch building modernizes the way Wilbert’s Lakeside recycles the fuel left in the tanks of salvage vehicles. Punching holes will eliminate potential hazard and ease the work of our Employees. The shell of the gas punch building is now complete. Now onto the interior – the next step will be to lay wire mesh and pour the concrete. The addition of a core bin in the building will provide a designated location for employees to place cores. “Cores” are what automotive recyclers refer to as the scrap parts that are no longer functioning that will be recycled without any chance of resale. The designated bin keeps cores organized and increases the efficiency of Wilbert’s Lakeside. 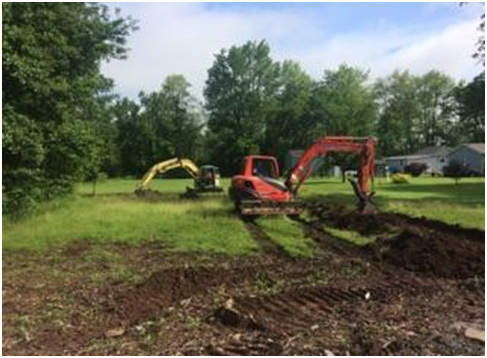 Simultaneously, the trees are being removed and fence lines are being established on the Northeast area of Lakeside’s property. This area will eventually become the employee parking lot. The lot will be fenced in 10 feet inside of the property line to provide adequate space for an earth berm. A ten foot high fence will be erected and the area outside of the fencer will be landscaped to provide neighborhood appeal.